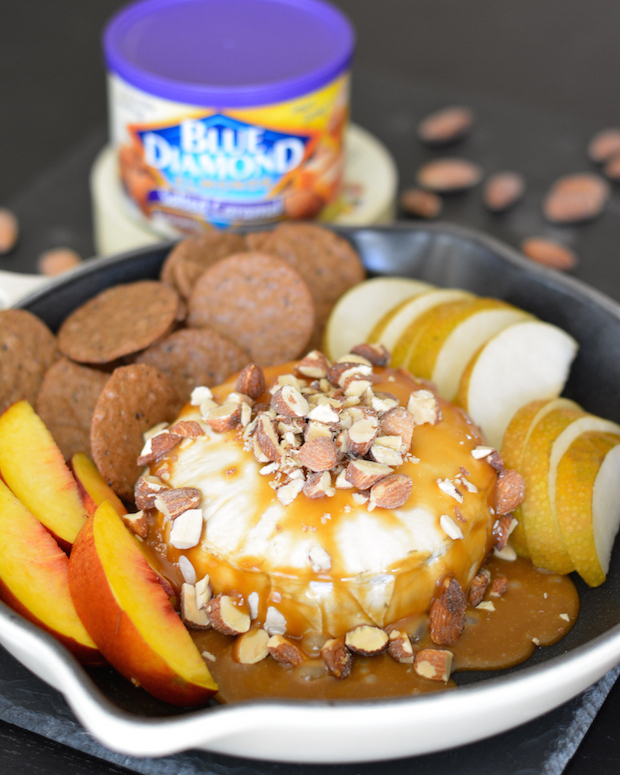 Melty brie cheese, gooey homemade caramel and salted caramel almonds come together for the most amazing appetizer or decadent dessert you’ve ever had! This post is sponsored by Blue Diamond Almonds. All opinions are my own. Thanks for supporting brands that support me! Cheese. My first true love. One of Nick’s best friends recently went vegan, which of course, meatatarian Nick harassed him about to no end. But over the last year, we’ve been eating way less meat than we used to. Over the last couple months (after watching the documentary Forks over Knives) I’ve even snuck in a few completely plant-based meals too, which all ended up being big hits! But. There’s one reason I could never be fully vegan. Ok, maybe bacon and lobster, too. But cheese. Oh cheese. How I love you, cheese. Maybe it’s my French roots, or maybe it’s just the fact that it’s so darn delicious, but I could definitely never live without cheese. If I ever became lactose intolerant, I’d probably need to save up money for a stomach transplant, because… cheese. Brie has always been a favorite. I like it cold, room temperature, baked and melty. I like the rind. I like it all. Love it all. For as long as I can remember, every holiday gathering with my French family has included baked brie. It’s such a tradition that if there ever isn’t a baked brie, it’s sorely missed. We usually just keep it simple and just sprinkle some brown sugar on top. Amazing. Over the years, I’ve had many variations of baked brie. With cranberries and pistachios on top, with apricot jam, with cinnamon apples, wrapped in puff-pastry. One thing is for sure, brie pairs amazingly well with something sweet. So I baked a brie. And I made some homemade salted caramel (which I had never done before, but now that I know how easy it is… dangerous). And I drizzled the caramel on top of the brie. And then sprinkled it with Blue Diamond Salted Caramel Almonds. And then I ate nearly the whole wheel and went into a cheese coma. For the record, I don’t necessarily recommend that last part. But I DEFINITELY recommend all the rest because, OMG– this is amazing. You could serve this as appetizer, or as dessert. You know us Frenchies love our cheese for dessert. You can serve it with crackers or some fresh fruit. Apples, pears or some crisp nectarines. If you want to die and go to cheese heaven, just make this. Now! Heat sugar over medium heat in a small saucepan, stirring constantly, until sugar clumps up and then melts to a smooth syrup. Carefully add butter while stirring constantly (mixture will bubble up). Continue cooking and stirring until butter is melted. Slowly pour in heavy cream while constantly stirring. Once cream is stirred in, continue cooking and stirring for 1 minute. Remove from heat and stir in salt. Let cool until slightly thickened, about 10 minutes. Place brie in a shallow baking dish (or cast iron skillet). Bake 10-15 minutes, checking after 10 minutes, until brie rind is puffed up in the middle. You want the brie to melt fully without busting the rind. 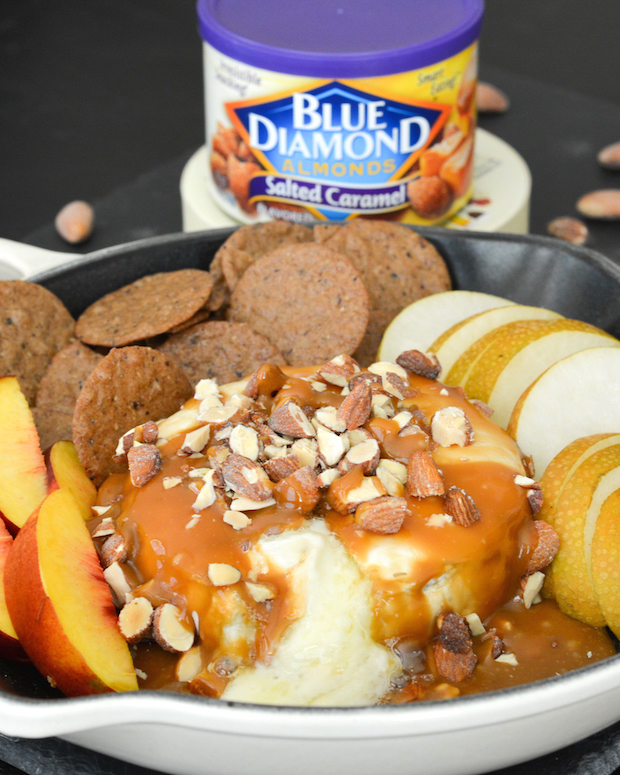 Remove brie from oven, pour caramel sauce over top, then sprinkle with almonds. Serve with crackers and sliced fresh fruit. You'll want to use a small wheel of brie that is fully encased in rind. If you use a slice of brie, decrease baking time and bake only until cheese is oozing out. I want to jump through my screen and dive face first into that baked brie. Seriously…that looks so GOOD!! Pinned :). Oh I love the sweet and salty and cheesy combination! I think it would be hard to avoid a cheese coma with this one! Pretty much impossible. 😛 Thanks, Ashley! I love Blue Diamond! (The smokehouse flavor is my fave!) What a creative way to use them nuts! Yes!! They have the BEST flavors!! Thanks, Amy! Wow! This sweet salty cheesy combination is incredible! This looks fantastic, and addition of nuts is so GOOD. 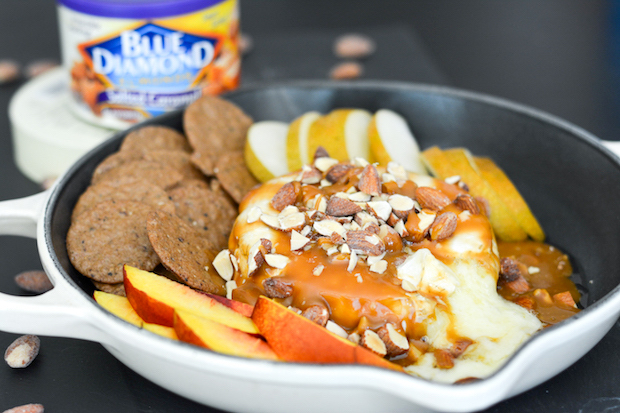 Love the idea of pairing brie with salted caramel and the Blue Diamond Almonds! Sweet and salty snacks are my favorite! As much as I dislike how animals are treated in the process, I cannot deny my love for cheese and meat. I’ve never had salted caramel with cheese before but paired with melty brie I can imagine it is the stuff of dreams. It really is!! You’ve gotta try it!! Oh, I agree – I wouldn’t want to live in a world without cheeeeeeeese. I would miss yogurt if I went vegan, too. But anyway, I’ve been on a big brie kick lately, and I’m always down for a great combo of sweet and savory. Love this recipe! Thanks, Lori!! Brie is definitely one of my favorites!! When I was vegan, not having cheese was the WORST part. That’s probably why I was only vegan for about 6 months, ha! This baked brie looks amazing! Haha, oh man. That sounds terrible!! Thanks, Natalie! Oh, this looks amazing! And I agree – some days I think I could be vegan … until I think about cheese! I could definitely give up bacon + lobster way before cheese. =) Wonderful combination of flavors + textures in this recipe, and what lovely pictures! Thanks, Amy!! Cheese is definitely sometimes my downfall. 😛 So yummy! Oh my goodness, I wish I had been there to help you devour this! It looks beyond droolworthy. Oh, I’m with you, girl! CHEESE is my one true love! And baked brie is soooo one of my faves. I usually go for the savory with pesto, so I love the sweet ideas going on here. I’m not a Frenchie, but I am in spirit with the love of the cheese! I can’t believe I missed this recipe, Jess! It looks beyond amazing! 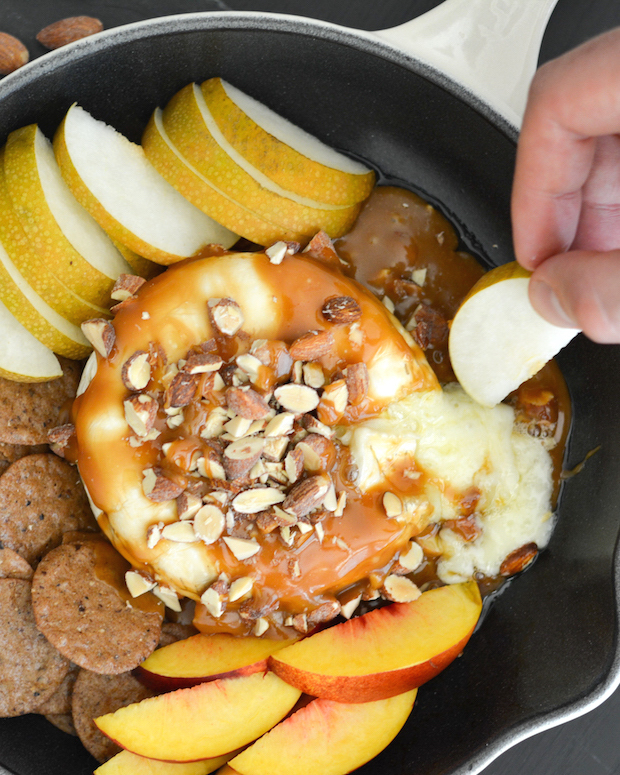 I’m kind of obsessed with those caramel almonds, so I love your creativity of sneaking them into this brie. I think I would devour this all and not share! Yum! This baked brie looks amazing, Jess! Love the flavours! GAHH! This brie! Jess, I seriously cannot even control my drooling right now. All that salted caramel-y goodness is pretty much killing me. I need to make this asap! Thanks, Sarah!! It definitely deserves a little drooling– so yummy! Yep, it totally was. I actually already made it a second time! So yummy!